Fundamentally veganism is a plant based diet, avoiding all meat, fish, dairy, eggs (and often honey). Another element of veganism is avoiding the use of animal-derived products such as leather, wool, silk or fur, or products tested on animals. As well as choosing not visit places where animals are kept in captivity or used for entertainment, such as the zoo, the races, or a circus that uses animals. There are many reasons why people choose to go vegan, but there seems to be three main motivations behind their decision: health, ethics and the environment. Health: There has been a lot of recent research to show that animal products are harmful to our health. Especially the excess in which we are consuming them today. Animal products are naturally high in cholesterol (no plant foods contain cholesterol), which has been linked to our biggest killer: heart disease. They have also been shown to cause cancer (vegan and vegetarians were found to be around 40% less likely to develop cancer compared to meat eaters), carry the highest risk of food-borne illness, contain hormones, contribute to antibiotic resistance, and as a result meat eaters simply don't live as long as vegetarians and vegans. Ethics: Many vegans go vegan simply because of their love for animals. I know learning about the atrocities of the animal agriculture industry and the cruelty that is happening behind closed doors is what pushed me to make the switch. Any sentient being is deserving of life and freedom. Avoiding animal products is therefore a direct way of no longer paying for the death and exploitation of animals for food and human use. "Roughly 60 billion land animals and over a trillion (!) marine animals are used and killed as commodities per year." Factory farming has taken over this industry, making up 98% of animal products sold in the UK. And the stark reality remains that animals living on an organic farm, still end up at the slaughterhouse. Similarly, animals in captivity, on race fields, performing in zoos, being used for research and testing, are all being unnecessarily exploited for human benefit. Vegans are fighting to stop this unnecessary exploitation, by boycotting an industry that is taking advantage of innocent beings that have been stripped of their freedom. Environment: Finally, the impact animal agriculture is having on our planet is shocking: Animal agriculture contributes more greenhouse gas emissions than all of transportation combined. It is estimated that animal agriculture is responsible for up to 91% of deforestation. Cows produce 150 billion gallons of methane per day. 2500 gallons of water are needed to produce just 1 pound of beef, 477 gallons to produce a pound of eggs, and almost 900 for cheese, and 1000 gallons for a gallon of milk. Animal agriculture is the leading cause of species extinction, ocean dead zones, water pollution, and habitat destruction. We could see fish-less oceans by 2050. And although we grow enough food to feed 10 billion people, much of the world goes hungry. Now if those facts don't shock you into decreasing your consumption of animal products, I don't know what will! Fruits and vegetables: Full of minerals and vitamins, upping your fruit and vegetable intake will be one of the main benefits to your health when going vegan. Some of my go-to fruits and vegetables are bananas, frozen berries, apples, dates, lemons, onions, peppers, mushrooms, aubergines, spinach, courgettes, carrots, broccoli, lettuce, rocket, cucumber, tomatoes. Legumes: These are one of the main forms of protein and iron on a vegan diet. Beans, lentils and peas are excellent sources of not only protein and iron, but fiber (of which meat has none), folate, zinc, manganese and antioxidants. It's important to properly rinse and cook legumes, so that you make the most of their nutrients. Favourites in our household include chickpeas, kidney beans, black beans, red lentils, split peas and green peas. Nuts and seeds: Nuts are another great source of plant-based protein, as well as fat, iron, fibre, magnesium, zinc, selenium, vitamin E and antioxidants. In our pantry we usually stock cashew nuts, walnuts, pecan nuts, pine nuts, pumpkin seeds, sesame seeds, sunflower seeds, chia seeds and flax seeds, as well as peanut butter and tahini. Grains: Carbs, carbs, carbs. Who doesn't love carbs? These will keep you full while eating a plant-based diet, and are often a good base for a meal. Some of the staples are rice, pasta, noodles, bread, as well as protein-rich quinoa. Plant milks: Going vegan doesn't mean you have to give up milk in your morning cereal or cup of tea. Soy, coconut, oat, almond, cashew, rice, hazelnut and hemp milks are all available today as a lower-impact alternative to cow's milk. Plus they're often fortified with calcium, vitamin B12 and vitamin D, which are all important on a vegan diet. I love unsweetened soy for my tea or porridge, coconut for (decaf) coffee, and almond for cereal. 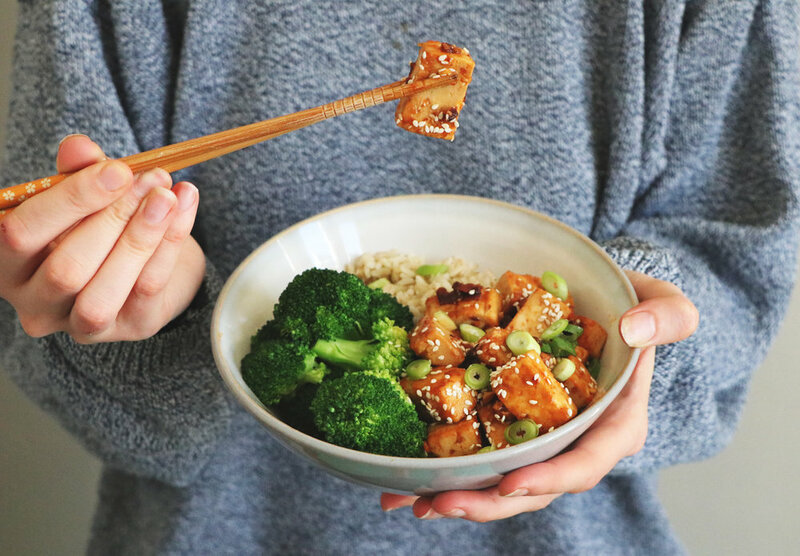 Tofu and meat substitutes: Tofu is a staple in many vegans diets because of its versatility, high protein content and similarity to meat when cooked in a certain way. Made from soybeans, tofu is very good for you (and my absolute favourite! 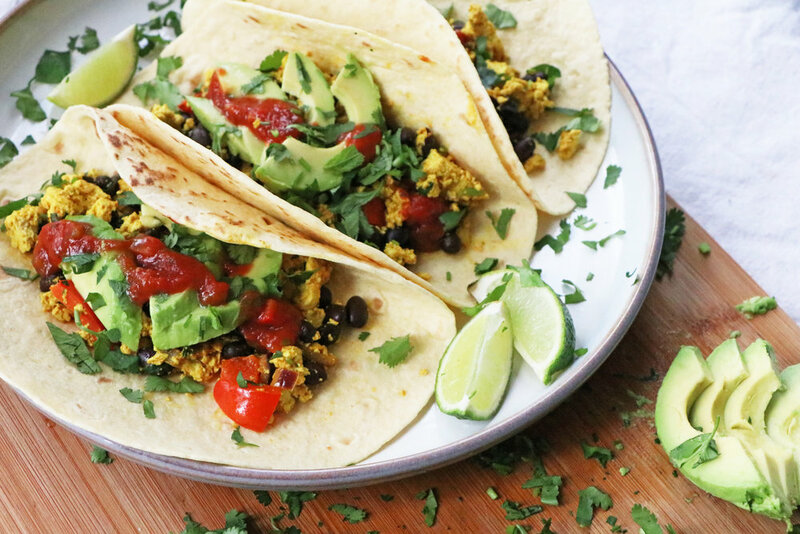 ), and can be used to make vegan alternatives such as tofu scramble, tofu nuggets or BBQ tofu. Tempeh, made from fermented soybeans, and seitan, made from wheat gluten, are two other common alternatives to meat. Luckily, more and more alternatives are becoming readily available in our supermarkets, such as vegan chicken nuggets, sausages, steaks, burgers etc., making it easier for you to go vegan! Vegan alternatives: Thankfully in the UK, there are so many new brands popping up every day selling different types of vegan cheeses, chocolates, sweets, cakes, biscuits, pizzas, pies, doughnuts, and just about anything else you can think of that isn't vegan. My favourite places to shop for vegan alternatives are local health food shops, Holland & Barrett, Tesco (their "Free From" range), Waitrose (they have recently created "Vegan" sections in their supermarkets), Sainsbury's (also a good "Free From" range), and Morrisons and Asda also have a good selection. do i need to supplement? It is recommended that you supplement a vitamin B12 on a vegan diet, simply because this cannot be sourced from plants. "But if veganism is so healthy, why would you need to supplement?" I hear you cry. To put it simply, we used to get our B12 from soil, when harvesting and eating our own foods. But unfortunately, the way food gets to our plates today: heavily sprayed, sanitised, processed and packaged, means that we need to supplement. Non-vegans are getting their B12 from animals that are eating from the soil, or are supplemented it themselves. So it's important that everyone is aware of their B12 intake, and supplements accordingly. This is one that I personally use. I also supplement vitamin D in the summer (England in winter = very little sunshine), an omega 3 supplement (like fish oil, except directly from the source itself, the algae), sometimes a protein powder in a smoothie and some probiotics to keep my gut healthy. CAN I EAT/USE/WEAR OLD VEGAN ITEMS? It's entirely up to you. Many vegans find it uncomfortable to continue wearing items made from animal products, others continue wearing them until they are old, and then re-purchase a vegan alternative. Don't worry too much about this at this stage, as its something you will learn and figure out for yourself in time. Also ignore anyone who points out to you that you're wearing a leather bag, or using non-cruelty-free makeup when you've just gone vegan. The same thing goes for secondhand items of clothing such as leather and wool. It is entirely up to the individual whether they purchase these items or not, as the damage is done and it is no longer contributing to the industry. Many would argue it is also less wasteful than buying new vegan alternatives that are often made from plastic. Now we've gotten the main questions out of the way, let's get on to my top tips to going vegan! You don't have to go vegan overnight, very few people do. Take it easy and don't let the process overwhelm you. Taking the time to slowly change your lifestyle habits, learn about plant-based living and make adjustments is important if you are dedicated to going vegan. Remember to make changes that suit you and your lifestyle, and at your own pace. There really is no rush, and the likelihood is that if you lessen the pressure, it's much more likely you'll be able to maintain it longterm. Knowledge is power. Gather lots of information to understand what veganism is all about. This will not only get you more passionate about why veganism is so important, keeping you passionate and determined, but will arm you with the know-how when friends and family inevitably start grilling you with lots of questions. I have linked some useful resources at the bottom of this article to get you started. Just because you're now vegan, doesn't mean you can't still enjoy all of your favourite foods. 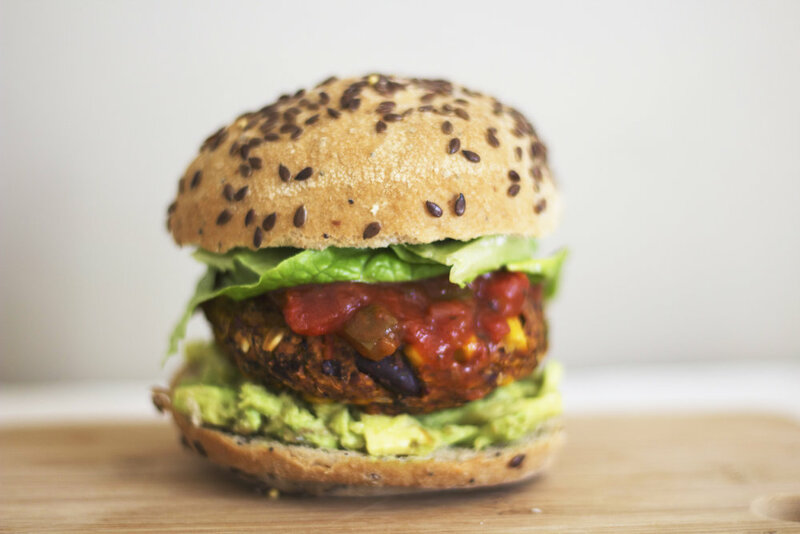 From burgers, to mac and cheese, pizza and brownies, you can still eat it all, just veganised! Do a quick google search of your favourite meal, add 'vegan' on the end and you'll discover plenty of ways to make your favourite foods vegan. But you don't even need to go to google, as you check out all of the recipes I have here on my blog, as well as my YouTube channel! One of the first things I did when I went vegan was go to my local supermarket to see what vegan options they had. Unfortunately back then there was only one gross vegan cheese that tasted like feet, leaving me feeling pretty sad about the cheeseless life I was about to embark on. But thankfully today (in the UK at least), there are so many new vegan options popping up every time I visit the shops or go out to eat. It's incredible how popular veganism is becoming, making it a lot easier to buy vegan versions of our favourite foods. So have a look around, see what is on offer, and get tasting! When you go vegan, you'll have to get used to reading lots of labels. Once you become a seasoned vegan, you'll get to know what foods do or don't contain hidden animal products. But at the start it takes some patience to find out whether you're favourite biscuits, crisps or sweets have sneaky animal-derived ingredients. Luckily allergens like milk, egg and fish are highlighted in bold, but there are some other ingredients to look out for. Check food labels for whey, casein, lactose, shellac, rennet, gelatine, carmine, anchovies, lactic acid, beeswax and certain E-numbers. The facebook group 100% Vegan Products UK is a great place to find out what is or isn't vegan. It can be incredibly frustrating when most of the people around you aren't vegan, don't understand veganism, or are avidly against it. I've learnt the hard way that getting mad about it won't really get you anywhere. And I get it, once your eyes have been opened to the horrors of the animal agriculture industry, it can be really hard not to get mad! But its important you channel that passion into setting an example to those around you, rather than getting mad at them. Show them how amazing it is to be vegan by cooking your nearest and dearest a delicious vegan dinner, share articles with them when they ask you questions you don't feel qualified or comfortable answering, speak openly but calmly about why you've made this choice, and suggest some documentaries or resources that got you thinking about this change. Yes, the atrocities that are happening to animals and our planet is angering, but find a way to process those feelings, as getting angry will turn more people off to what you have to say, than make them listen. Now that you've veganised your favourite meals, scoped out the local vegan options and become a whizz at reading labels, it's time to get creative! Plant based cooking is a whole other world, with ingredients, spices, and combinations you've probably never considered before. Since going vegan, I have experimented more with food than I ever have done, finding a real passion for cooking. The possibilities are endless when it comes to plants, and the more you experiment, the more you'll learn what does or doesn't work! Doing anything alone can be tricky. And living in a very non-vegan world as a vegan can quickly become hard if you don't have a support system. Although you may not have anyone currently in your life who is vegan, it's important to reach out and connect with a community to help you through this transition. Social media is an incredibly powerful source of inspiration for many people to go vegan, so make the most of it! Follow other vegans online who share recipes, ideas and support, join online forums and groups, and consider sharing your own journey online! But also get involved in real life, finding out if there are any vegan potlucks happening in your area, vegan activist groups or vegan meet-ups. Getting involved and finding other like-minded people will not only help to make you feel less alone, but make you feel a part of something important. I'm just going to throw it out there now: you're going to mess up. Whether that's intentionally or unintentionally, mistakes will happen. And there is absolutely no need to beat yourself up about it! Nobody is going to call the vegan police, and there is no use crying over spilt (vegan) milkshake. Learn from it, forget about it and move on. You're suddenly changing a very fundamental part of your everyday life, and its inevitable that you'll accidentally eat a sandwich you thought was vegan but actually had some mayo in it, or you're going to give in to your old habits and devour a late-night cheesy pizza after one too many drinks. Don't let anyone (including yourself) judge you for this. If your intentions are good and you're trying your best, then that's all that matters. And just remember, these mistakes will happen less and less over time as you leave behind old habits and adjust to this lifestyle. This leads me to my final point: please don't give up! I've seen it time and time again online where people give up on veganism too soon! They set themselves high expectations such as transforming their health, being able to be the perfect vegan overnight, lose a load of weight or have all of the answers straight away. And when these expectations aren't met, they throw in the towel and give everything up. Please don't do this! Leave behind unrealistic expectations, and remember that veganism is fundamentally about reducing the amount of harm you are causing as an individual. Veganism is not a fad diet, a miracle cure for your health issues, or something you'll necessarily find easy. Things take time, and making an adjustment to your everyday diet and way of life, will definitely take time. If you're feeling bloated and fed up, allow your body to adjust, and maybe take a slower approach, introducing more vegan foods over time. If veganism hasn't been the answer to your weight loss dreams, remember that this is not a "diet" in the traditional sense, and shouldn't be treated as one. And if you make a mistake and fall off the wagon for an evening, a day, a week, a month, move on and get back on it! Remember why you wanted to do this in the first place and find a way that suits you. And finally, good luck! I'm here to answer any questions you have in the comments down below, and help you on your vegan journey. My website and YouTube channel is full of recipes, resources and helpful information all about veganism, so go take a look, get excited and start eating lots of yummy vegan food!